Trying to decide between universities and courses can get complicated. The Universities Admissions Centre (UAC) use a preference system to manage your course choices. The best advice we can give you is to put the course you really want to do as your first preference. But there’s a bit more to it than that. You can list up to five course preferences. 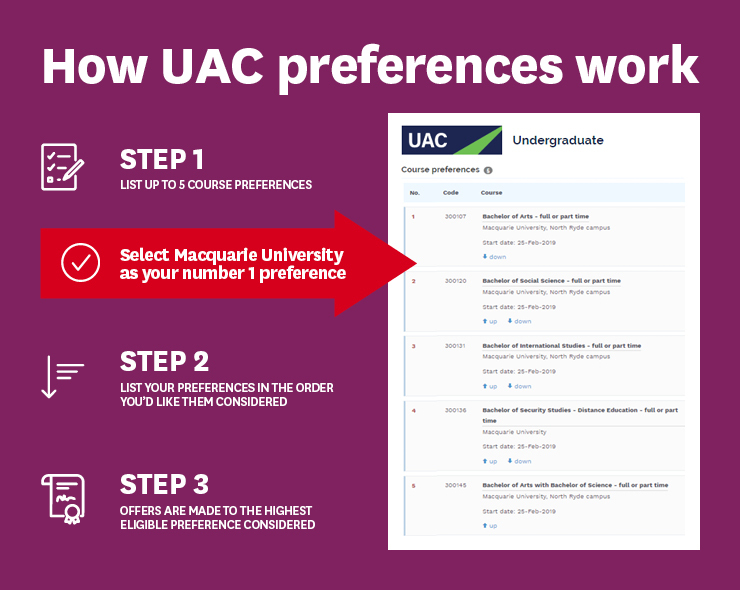 You can add, delete or change the order of your preferences at any time using UAC’s Manage your application system; however, preferences will be considered as final at the preference change closing date of each offer round. See UAC’s key dates for each offer round. List your preferences in the order you’d most like them to be considered. All offers are made to the highest eligible preference. If you’re not made an offer for your first preference, you’ll be considered for your second preference and so on in order. If you receive an offer for your first preference and would like to be considered for lower preferences in later rounds, you can change the order of your preferences by the preference change closing date for respective offer round. You can only receive one offer per round, so re-ordering your preferences after each round may give you multiple offers to choose from. Got a question about UAC?